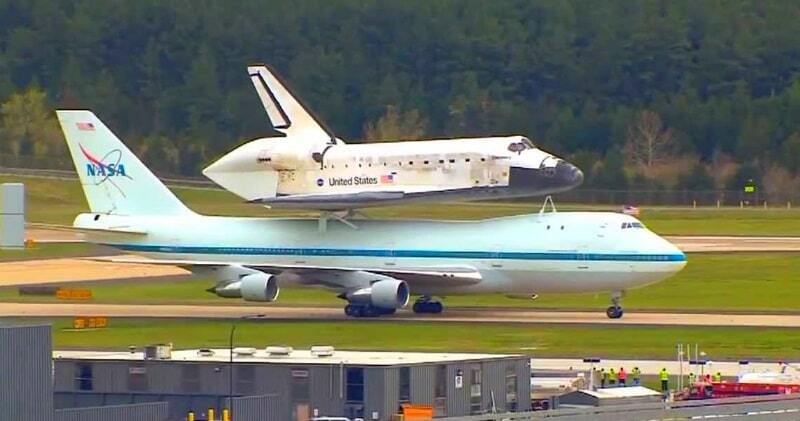 It has been called the world’s greatest piggyback ride: a space shuttle, atop a Boeing 747 jet aircraft. But this is no ordinary 747, this is the Shuttle Carrier Aircraft…the SCA. This specially modified jumbo jet was not only a taxi service for the shuttle, but also helped in the development of the shuttle itself. In 30 years of flying, the majestic image of a spacecraft joined to the SCA, became a symbol of American invention and ingenuity.The Shuttle Carrier Aircraft is Boeing 747, like the other aircraft of its type is 232 feet long , 63 feet tall to the top of the tail and has a 196-foot wingspan. The Avionics and engines were also upgraded, and an escape tunnel system similar to that used on Boeing’s first 747 test flights was added. While carrying a space shuttle, the SCA maximum speed is 0.6 Mach 695 kilometers per hour. The service ceiling is 15,000 feet (4,572 meters) and its range is 1,850.75 kilometers. Shuttle Carrier retired on February 8, 2012 after its final mission to the Dryden Flight Research Facility at Edwards Air Force Base in Palmdale, California, and was used as a source of parts for NASA’s Stratospheric Observatory for Infrared Astronomy (SOFIA) aircraft, another modified Boeing 747.